PONTIAC, Ill. – About 5,000 tons of trash from Chicago and the surrounding area is dumped every day at a landfill in Livingston County, but hardly any of it goes to waste. Like many active landfills, the one operated by Republic Services in Pontiac has found a way to take our trash and convert it into energy – lots of energy. At any given time, Republic’s landfill gas power plant generates enough energy to sustain 10,000 homes. 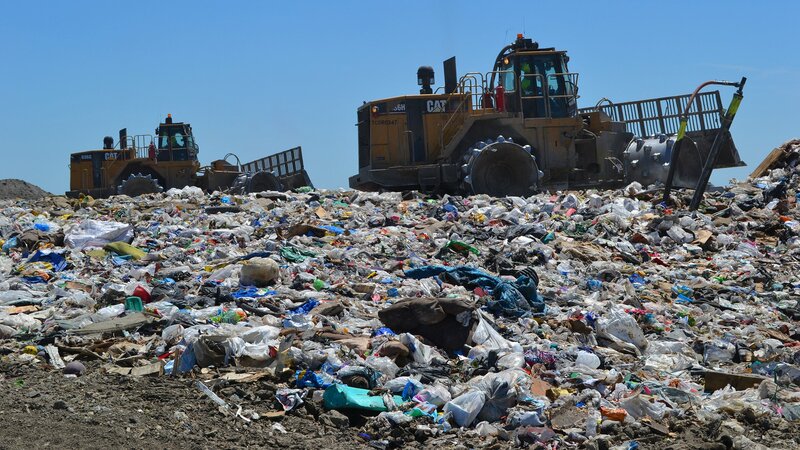 The operation is one of more than 600 projects launched nationwide under the Environmental Protection Agency's Landfill Methane Outreach Program, which works with waste companies to reduce or avoid methane emissions from landfills. Since the program began 20 years ago, participating landfills have avoided releasing a total of 345 million metric tons of carbon dioxide, according to the EPA. Once it’s collected from city sidewalks and alleys, Chicago’s trash gets hauled off to four different landfills – two in Illinois and two in Indiana, and all about 100 miles from the city – including Republic’s site a couple miles off I-55 in Pontiac. After checking in at the landfill’s entrance, garbage trucks climb a 150-foot hill to reach the 10-acre hole where about a year’s worth of trash is being dumped, condensed and eventually covered with an airtight liner. Once the current “cell,” as Republic calls it, is filled, the company will begin collecting waste at a new cell that is being prepared now. As the waste decomposes, it produces what is known as landfill gas, made up primarily of methane and carbon dioxide, both greenhouse gases that contribute to global warming. Older landfills don't have efficient ways of capturing this gas, so it escapes into the atmosphere, but many modern landfills employ an elaborate network of pipes and vacuums to capture the gases, which are then directed to a renewable fuel facility that converts them into energy. In 2016, when the landfill received more than 1.4 million tons of trash, it also removed 0.5 million tons of carbon dioxide from the air, equivalent to the carbon emissions produced by about 100,000 vehicles in a year. How exactly does trash dumped into a giant hole come out as energy? Think of the hole as a bathtub, Holcomb said. After it’s compressed and dried, the gas is sent to Hoosier Energy, which has the rights to the gas produced at the landfill. The company, based in Bloomington, Indiana, then converts the gas to energy, which it sells to utility providers like ComEd. Republic gets a few pennies for each kilowatt of energy that is generated, Holcomb said. The payments help to offset some of the costs to build and maintain the system of pipes and pumps that collect gases from decomposing waste. Although capturing the gases is expensive, waste companies are required to collect and control gas under the Clean Air Act or risk receiving fines from the federal or state EPA. Companies are also allowed to flare, or burn, landfill gas. The process prevents the gas from escaping into the air but fails to convert it into energy. In addition to the expensive network of pipes and vacuums, Republic uses a credit card-thin layer of specialized plastic to contain waste liquids within the landfill. The liner sits atop about three feet of clay. The system allows Republic and other landfill operators to make the process of waste decomposition, which lasts 30 years, relatively clean. June 26: Chicagoans dump more than 800,000 tons of garbage into their bins every year, but once city garbage trucks leave the alley, most of us have no idea where it all goes. We follow the trail.